This article gives you the knowledge required to edit a website that uses Head Start Design's content management system. It also provides links to other articles that will help you to make the most of your website. If the prospect of editing your website make you nervous, you may want to start by reading the following article: What every website owner should know. Click on the link in your "Welcome Email" to browse your website in "edit-mode". You can then right-click on content that you want to change and choose from the options presented. 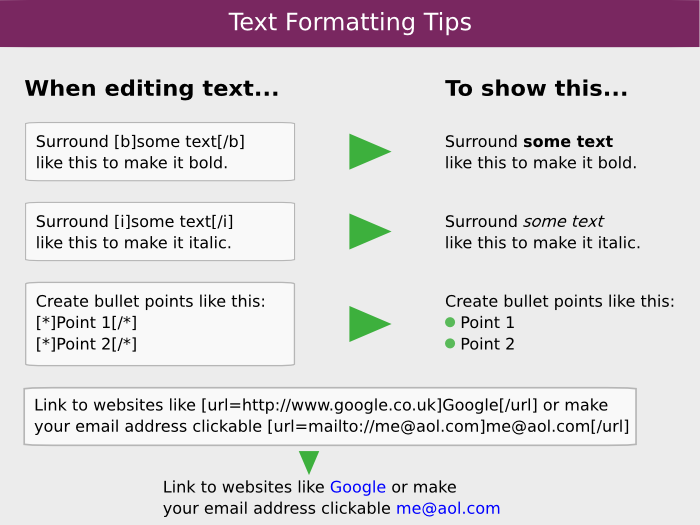 We don't include complex text formatting tools (fonts, colours, tables etc.) on your website as these introduce inconsistencies and often result in messy code being generated. However, we do have a few formatting option which you can make use of and a way to include links to other pages or websites of interest to your customers. We advise that you make minimum use of the bold, italic and bullet points as overuse can make your web page harder to read. See the following article to learn how you can benefit from free traffic from search engines: A beginners guide to search engine optimisation.